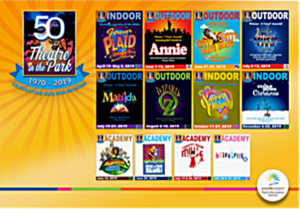 Join The Theatre in the Park (TTIP) as it celebrates its “Golden” 50th season with a dazzling line-up of musical favorites. Combined with a second year of fun-loving indoor shows as well as the TTIP Academy program at the Johnson County Arts & Heritage Center, a total of 12 musical productions round out this sizzling season of entertainment featuring the best talent Kansas City has to offer! TTIP’s outdoor venue at Shawnee Mission Park will feature five musical productions including two premieres. 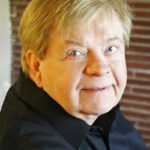 “2019 will be a terrific milestone for TTIP-our 50th season,” said Producing Artistic Director Tim Bair. “We’ve got a terrific season planned including some all-time TTIP favorites like ANNIE, THE MUSIC MAN, and THE WIZARD OF OZ, and a few premieres like CHITTY CHITTY BANG BANG* and the newly released MATILDA*! There is something for everyone of every age,“ Bair said. Auditions for the TTIP OUTDOOR 50th summer season will be held Saturday and Sunday, Feb.
23 and 24 at the Johnson County Arts & Heritage Center (AHC) in Overland Park. Full details will be available on the TTIP web site, www.theatreinthepark.org, early in 2019. Based on the popular comic strip by Harold Gray, ANNIE has become a worldwide phenomenon with popular songs “Tomorrow” and “Hard knock Life”. The beloved book and score by Tony® Award winners, Thomas Meehan, Charles Strouse and Martin Charnin, ANNIE won seven Tony® Awards and numerous well-know actresses – from Andrea McArdle to Sarah Jessica Parker – have portrayed the title role. Set in the 1930s in New York City, little orphan Annie charms everyone’s hearts despite a next-to-nothing start. She is determined to find the parents who abandoned her years ago in an orphanage that is run by the cruel, embittered Miss Hannigan. With the help of the other girls in the orphanage, Annie escapes to the wondrous world of NYC. With fun-filled adventures galore, Annie flees Miss Hannigan’s evil clutches and finds a new home and family in billionaire, Oliver Warbucks, his personal secretary, Grace Farrell, and a lovable mutt named Sandy. This story surrounds Caractacus Potts, an eccentric inventor, who sets about restoring an old racecar from a scrap heap with the help of his children, Jeremy and Jemima. The trio soon discovers the car has magical properties, including the ability to float and take flight. But trouble is not far away as the evil Baron Bomburst wants the magic car for himself. The family joins forces with Truly Scrumptious and batty Grandpa Potts to outwit the dastardly Baron and Baroness and their villainous henchman, the Child Catcher. Seventy-six trombones lead the big parade in this all-American classic by Meredith Wilson. Performed during TTIP’s first summer of musicals in 1970, THE MUSIC MAN is funny and wicked, romantic and touching – and it’s family entertainment at its best. Meredith Wilson’s six-time, Tony® Award-winning musical comedy has been entertaining audiences since 1957. 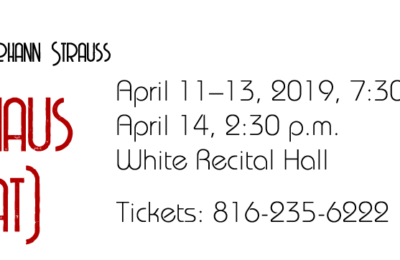 This family-friendly tale follows a fast-talking traveling salesman Harold Hill as he cons the people of River City, Iowa, into buying musical instruments and uniforms for a boys’ band that he vows to organize –despite the fact that he doesn’t know a trombone from a treble clef. Instead, he employs the “think method” as he plans to skip town with the cash –until he meets Marian, the librarian, who transforms him into a respectable citizen by curtain’s fall. A TTIP premiere, MATILDA is the story of an extraordinary girl who, armed with a vivid imagination and a sharp mind, dares to take a stand and change her own destiny. Inspired by the twisted genius of Tony® Award winner Roald Dahl, MATILDA THE MUSICAL is the captivating masterpiece from the Royal Shakespeare Company that revels in the anarchy of childhood, the power of imagination and the inspiring story of a girl who dreams of a better life. MATILDA, with book by Dennis Kelly and original songs by Tim Minchin, has won 47 international awards and continues to thrill sold-out audiences of all ages around the world. While it has been 80 years since the release of the popular film, this beloved musical remains a perennial favorite. First performed at TTIP in 1975, THE WIZARD OF OZ begins on a farm on the Kansas prairie when a tornado transports Dorothy over the rainbow to a land beyond that’s very different from her home. Leaving her humdrum life with her Aunt Em and Uncle Henry behind, Dorothy discovers the Land of Oz filled with lots of green, magic, little Munchkins and a Wicked Witch. Determined to return to her home, Dorothy is told to follow the Yellow Brick Road to find the powerful Wizard of Oz, who can make her dream of returning home come true. Along the way she makes new friends with a Scarecrow, Tinman and Cowardly Lion. Wearing magical ruby slippers, Dorothy and her friends travel to see the Wizard but The Wicked Witch tries to stop her at every turn. Along her adventurous journey, Dorothy discovers the magical power of home. Showtime for the five 2019 TTIP OUTDOOR productions is 8:30 p.m.; the box office opens at 6:30 p.m. and the gates to the seating bowl open at 7 p.m. TTIP OUTDOOR ticket prices are $8 for adults, $6 for youth and children three and under may attend for free (but require a ticket for entrance). Reserve seats and parking are also available. Tickets may be purchased online at www.theatreinthepark.org beginning early 2019 or at the theatre box office the nights of performance. MOVIES IN THE PARK returns to TTIP’s outdoor amphitheater for only one buck! Titles will be announced in the spring. For movies, gates open at 7:30 p.m. with films starting at 8:30-8:45 p.m., depending on sunset. TTIP’s production schedule became year-round in 2017 when it became the resident theatre company of the Johnson County Arts & Heritage Center. The 2019 TTIP INDOOR productions include two premieres, a musical theatre classic and a holiday favorite. All INDOOR productions take place in the Black Box Theatre of the Johnson County Arts & Heritage Center. TTIP INDOOR is also the home for four Academy productions (three in the summer) and, over the winter school break, the forever-fun musical, HAIRSPRAY JR.
One of the most popular small “juke box” musicals in recent memory, FOREVER PLAID is a fun revue packed with classic barbershop quartet harmonies and pitch-perfect melodies! Once upon a time, there were four guys (Sparky, Smudge, Jinx and Frankie) who discovered that they shared a love for music and then got together to become their idols – The Four Freshman, The Hi-Lo’s and The Crew Cuts. Rehearsing in the basement of the Smudge family’s plumbing supply company, they became the group “Forever Plaid”. On the way to their first big gig, the “Plaids” are broadsided by a school bus and killed instantly. It is at the moment when their careers and lives end that the story of Forever Plaid begins. Singing in close harmony, squabbling boyishly over the smallest intonations and executing their charmingly outlandish choreography with overzealous precision, the “Plaids” are a guaranteed smash! Audiences will croon along with beloved songs from the 1950s and laugh together with the delightful patter the “Plaids” provide. Dancehall hostess Charity Hope Valentine is a hopeless romantic looking for someone to love and to love her back. Inspired by Federico Fellini’s Nights of Cabiria, SWEET CHARITY follows Charity’s turbulent love life in New York City- it’s musical comedy at its best. This tuneful mid-1960s score by Cy Coleman with snazzy lyrics by Dorothy Fields, SWEET CHARITY includes such songs as “Big Spender” and “Rhythm of Life”. With a hilarious book by the iconic theatre ledgend Neil Simon, SWEET CHARITY captures all the energy, humor, and heartbreak of life in the big city for an unfortunate but irrepressible optimist. Charlie Brown, Lucy, Snoopy and the Peanuts gang gather together to celebrate the holidays, in this show based on the animated television special of the same name. It’s the Christmas season and Charlie Brown complains about the overwhelming materialism he sees in everyone. At Lucy’s suggestion, Charlie Brown becomes director of the school Christmas pageant but it proves to be a frustrating endeavor. When an attempt to restore the proper holiday spirit with a forlorn little Christmas fir tree fails, Charlie Brown needs his pal Linus’ help to discover the real meaning of Christmas. TTIP INDOORS evening productions are at 7:30 p.m. and matinees are at 2 p.m. Please check the TTIP web site for exact times. INDOOR tickets are reserved seating but prices vary; pricing is available on line. The TTIP Academy program continues this summer and over the winter break, including two KIDS style shows, and one JUNIOR style show. The Summer Academy is split into three sessions. The TTIP Academy focuses on developing children’s talents in the performing arts using local as well as national teaching artists in this hands-on program. June Academy sessions are geared for children in third through eighth grades; the July session is for children in fifth through 12th grades. Enrollment begins early in 2019; details are available at www.theatreinthepark.org/academy. The TTIP Winter Academy production, held during the school break, is geared to older teens and requires an audition. MADAGASCAR-A MUSICAL ADVENTURE JR (June 15 with two performances; rated G) Third through sixth graders will enjoy performing in this musical based on the smash DreamWorks animated motion picture. MADAGASCAR – A MUSICAL ADVENTURE JR. follows all of your favorite crack-a-lackin’ friends as they escape from their home in New York’s Central Park Zoo and find themselves on an unexpected journey to the madcap world of King Julien’s Madagascar. This production is for the fifth through eighth grade crowd. With its poignant story and catchy Caribbean-flavored score, ONCE ON THIS ISLAND JR. is an original theatrical adaptation of Hans Christian Andersen’s popular fairy tale, The Little Mermaid, and the Tony®-nominated Broadway musical by the legendary writing team, Ahrens and Flaherty. Through almost non-stop song and dance, this full-hearted musical tells the story of Ti Moune, a peasant girl who rescues and falls in love with Daniel, a wealthy boy from the other side of her island. When Daniel is returned to his people, the fantastical gods who rule the island guide Ti Moune on a quest that will test the strength of her love against the powerful forces of prejudice, hatred and even death. Toes will be tappin’ as this high-energy Broadway hit production for the fifth through 12th grade set. It’s 1922 in New York City and Millie Dillmout just moved to the Big Apple to start a new life. With the hope of landing a job working for a wealthy boss and eventually marrying him, things don’t go according to plan for Millie. But in the end, things work out for our small town girl. This adaptation of the six-time Tony® winner is a high-spirited musical romp complete with fun flappers, dashing men and a villainess audiences will love to hate. Welcome to the 60s with change in the hair! Adapted from the Broadway production that captured eight Tony® Awards, HAIRSPRAY JR. is the family-friendly musical piled bouffant-high with laughter, romance and deliriously tuneful songs. Hairspray JR. is a show that will celebrate students’ diversity and bring audiences to their feet with its positive message and uproarious sense of humor. Plus-size teen Tracy Turnblad, has one big dream – to dance on the popular “Corny Collins Show.” When Tracy finally gets her shot, she’s transformed from social outcast to sudden star. In balancing her newfound power with her desire for justice, Tracy fights to dethrone the reigning Miss Teen Hairspray and integrate a TV network in the process. With the help of her outsized mom, Edna, and guest DJ, Motormouth Maybelle, the rhythm of Tracy’s new beat just might prove unstoppable. (NOTE: This production is an audition-based program. Audition and registration information will be provided in early 2019. The Theatre in the Park OUTDOOR performs in a beautiful amphitheatre located inside Shawnee Mission Park at 7710 Renner Road, in Shawnee, KS. TTIP INDOOR performances take place in the Black Box Theatre at the Johnson County Arts & Heritage Center, 8788 Metcalf, in Overland Park, KS. Theatre in the Park is a program of the Johnson County Park & Recreation District. TTIP is the largest outdoor community theater in the country, and has been providing quality theatre entertainment in the community for half a century! The 2019 season sponsors include Advent Health and First National Bank. For more information about 2019 TTIP productions, please visit www.theatreinthepark.org.